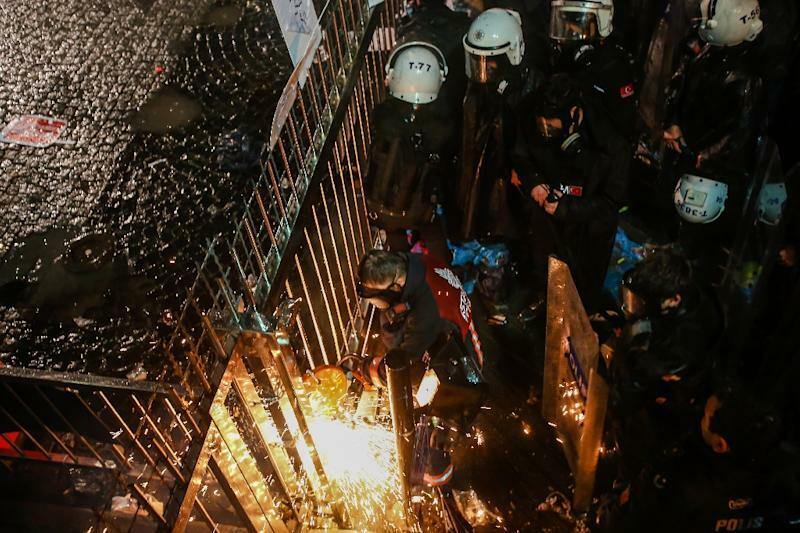 Istanbul (AFP) - Turkish police on Friday raided the premises of a daily newspaper staunchly opposed to President Recep Tayyip Erdogan, using tear gas and water cannon to disperse supporters and enter the building to impose a court order placing the media business under administration. 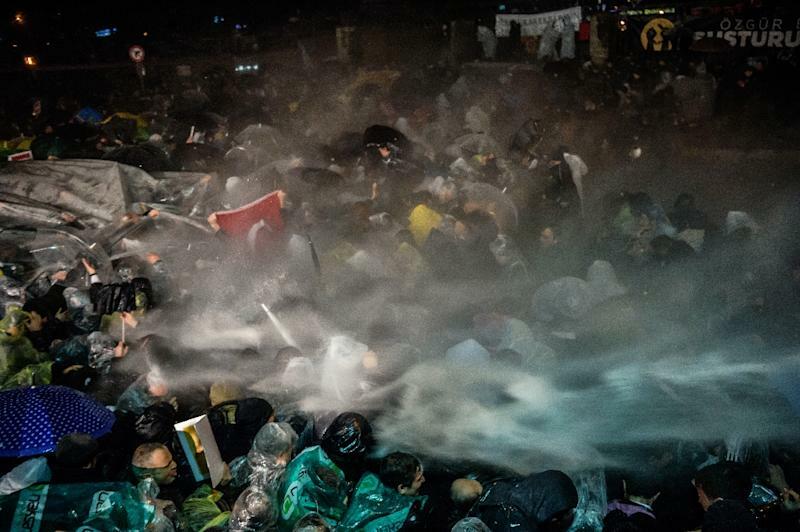 Police fired the tear gas and water cannon to move away a hundreds-strong crowd that had formed outside the headquarters of the Zaman newspaper in Istanbul following the court order that was issued earlier in the day, an AFP photographer said. Zaman, closely linked to Erdogan's arch-foe the US-based preacher Fethullah Gulen, was ordered into administration by the court on the request of Istanbul prosecutors, the state-run Anatolia news agency said. There was no immediate official explanation for the court's decision. The move means the court will appoint new managers to run the newspaper, who will be expected to transform its editorial line. 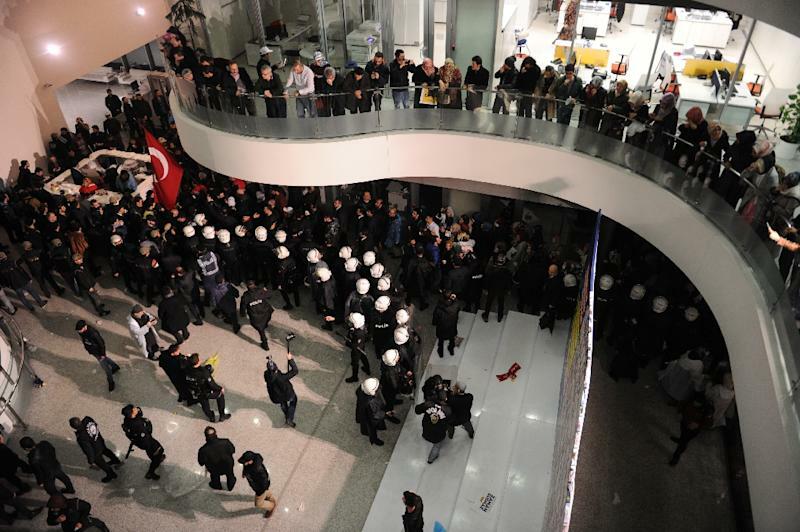 Hundreds of supporters had gathered outside the paper's headquarters in Istanbul awaiting the arrival of bailiffs and security forces after the court order. "We will fight for a free press," and "We will not remain silent" said placards held by protestors, according to live images broadcast on the pro-Gulen Samanyolu TV. "Democracy will continue and free media will not be silent," Zaman's editor-in-chief Abdulhamit Bilici was quoted as saying by the Cihan news agency outside its headquarters. "I believe that free media will continue even if we have to write on the walls. I don't think it is possible to silence media in the digital age," he told Cihan, part of the Zaman media group. But shortly before midnight (2200 GMT), a team of police arrived with two TOMA water cannon trucks and dispersed the crowds also using tear gas. Police then marched into the premises of the newspaper to seize the headquarters and formally place it under administration. The court order had already aroused the concern of the United States, which said it was "the latest in a series of troubling judicial and law enforcement actions taken by the Turkish government targeting media outlets and others critical of it." "We urge Turkish authorities to ensure their actions uphold the universal democratic values enshrined in their own constitution, including freedom of speech and especially freedom of the press," State Department spokesman John Kirby said. Gulen has been based in the United States since 1999 when he fled charges against him laid by the former secular authorities. Turkey has asked the United States to extradite him but Washington has shown little appetite for doing so. Despite living outside of Turkey, Gulen built up huge influence in the country through allies in the police and judiciary, media and financial interests and a vast network of cramming schools. Ankara now accuses Gulen of running what it calls the Fethullahaci Terror Organisation/Parallel State Structure (FeTO/PDY) and seeking to overthrow the legitimate Turkish authorities. There have been numerous legal crackdowns on structures linked to the group and on Friday Turkish police arrested four executives of one of the country's largest conglomerates, accusing them of financing Gulen. Boydak Holding group president Haci Boydak, director general Memduh Boydak and two board members were questioned at their homes in the central city of Kayseri. Gulen supporters decry the accusations as ridiculous, saying all he leads is a more informal group known as Hizmet (Service). The effective seizure of the newspaper by the state comes amid growing concerns over freedom of expression in Turkey under Erdogan's rule. The daily Cumhuriyet newspaper's editor-in-chief Can Dundar and Ankara bureau chief Erdem Gul were released on an order from Turkey's top court last week after three months in jail on charges of publishing state secrets. But they still face trial on March 25. Meanwhile almost 2,000 journalists, bloggers and ordinary citizens, including high school students, have found themselves prosecuted on accusations of insulting Erdogan. Independent pro-Kurdish television channel IMV TV was taken off air in Turkey last weekend following accusations that it broadcast "terrorist propaganda" for militants. The raid on Zaman comes as Prime Minister Ahmet Davutoglu heads to Brussels Monday for a crucial summit meeting with EU leaders. The news of the court decision broke as Erdogan was holding talks in Istanbul with EU President Donald Tusk. Critics have accused the EU of turning a blind eye to the situation with media freedom in Turkey in exchange for Ankara's cooperation in the refugee crisis. However the government angrily dismisses allegations it is cracking down on the press, saying the cases against Cumhuriyet and pro-Gulen media have nothing to do with freedom of expression.